Robbie Burns and Scotch Eggs. Let me first say that I am not Scottish by birth. But I grew up with all things Scottish so I think that through osmosis I have absorbed some Scottish blood. I must have. Otherwise why would the sound of the bagpipes make me happy and the sight of men in kilts make me swoon? There is no other explanation. I don’t listen to the pipes often (or hang out with men in kilts for that matter) but to keep a little Scottish in my life I have adopted the annual tradition of a Burns dinner. I spent most of my formative years thinking Robbie Burns day was just another night as my friends and I, performed the requisite highland dances at events and watched our parents drink, laugh and let loose. But as I grow older I have been able to look back and realize what great moments those were. 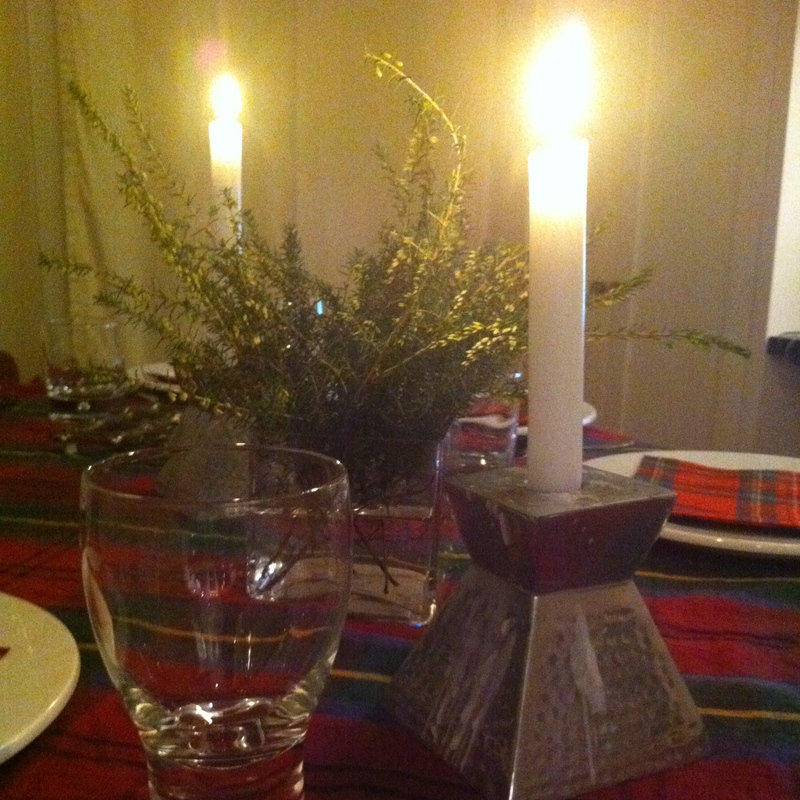 I now realize that traditional or not, what a Robbie Burns day dinner has to offer is poetry, food, music and friends. Like all great meals it is a chance to gather and share. Last year I hosted my first annual Robbie Burns dinner. Just a small group of people but with lots of laughs, music, and good food. By purists standards probably not traditionally acceptable, but for my gang, just what the scotsman ordered. The catch is, if you are going to call something the first annual, it implies you will have a second annual. So having one I am. This year I am trying a few new recipes including Rumbledethumps (cabbage and potato) and Cranachan (kind of like a tipsy granola and fruit). But following on the surprise hit (and absolute hilarity) of last years dinner, Scotch Eggs will be making a reappearance on this years menu. 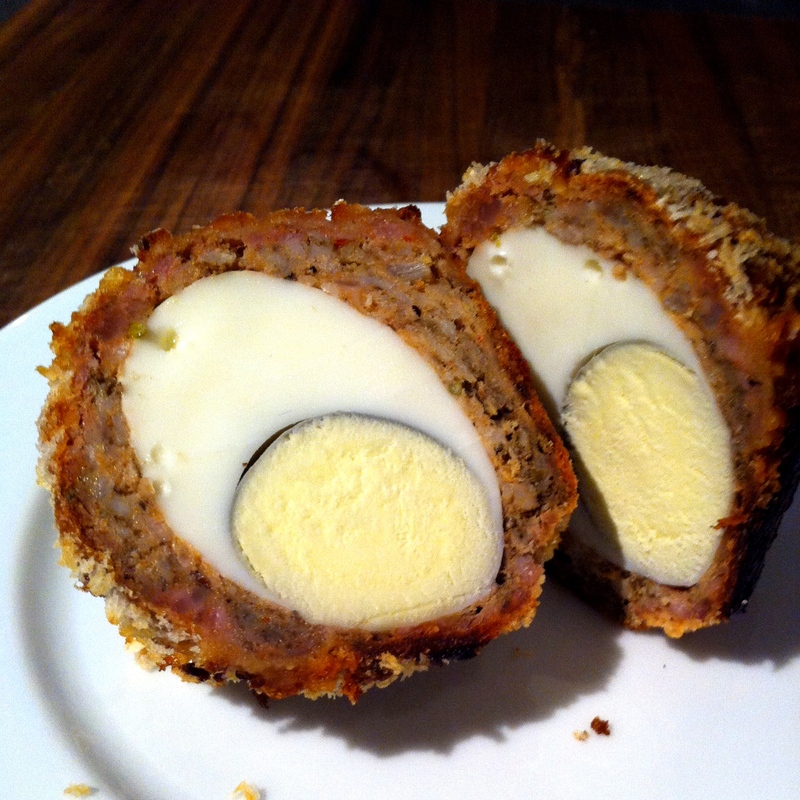 Now Scotch Eggs are something that I remember from my years camping as a girl guide. I have no idea why, but for some reason we often seemed to have them. Odd. Recently I’ve have also been noticing them on “paleo” websites (Gawd I hate that trend. Do not get me started.). But really they are simply bar food. Kind of the (semi) healthy equivalent of potato skins or natcho’s. Since making them last year I’ve been experimenting (quite) a bit from a traditional recipe. I often use spiced turkey sausage rather than pork and I’ve been baking them not deep frying (although I can’t lie, deep fried ones are amazing….). I’ve also been trying all manner of coatings from the traditional white flour to spelt, to almond, to my current favourite panko, and, playing with different spice mixtures. It’s kind of what makes them fun. The variations are endless and not only are they an easy and filling bite of protein but they are also excellent as an snack. Now, I can’t lie. I’m not sure they are actually traditional Burns dinner fare, but they are tasty and people seem to like them. So in the spirit of Robert Burns, I encourage you to raise a glass and try them. First hard boil, cool and peel your eggs. This can easily be done the day before. I have a terrible tendency to over cook eggs, if anything these can be slightly undercooked as they will be re-cooked in the oven. I set my timer for 5 minutes from the time the water starts to boil and it seems to be about the correct time. Cut one end off of each of your sausage links and squish the contents into a large bowl. (Hint: If you get friendly with your butcher they will often just sell you the meat minus the casing which saves on waste and time.) If using unspiced sausages you might want to add cumin, cayenne, garlic, pepper or various other spices to taste. And, I can’t lie, the higher the fat percentage the tastier they will be (I love a good proper Italian sausage) …. the leaner the sausage the more the spice. Your choice. In a row on your counter set up four bowls. The first with the sausage, the next with the flour, the next with the egg whites, and the final with the bread crumbs or panko (hint, I often add lots of ground pepper and sometimes even some spice to the breadcrumbs). Turn your oven to 375 degrees and line a sheet pan with parchment paper (not imperative, but helps with the mess and the crispness). Divide the sausage into the same amount of sections as you have eggs. Take the one section of sausage and in your hand make what seems like a very flat hamburger patty. Wrap the meat evenly around each egg. Sealing all edges. Wash your hands. Moving onto the next bowl roll the egg in the flour mixture, then the egg whites and then finally the breadcrumb/panko mixture. Use your hand to pour more overtop if rolling doesn’t sufficiently cover it. Don’t worry, you will most likely still see a bit of the sausage through the flour. Note, this is a very messy. I try to keep one hand as the sticky hand and the other as the clean one! Once coated, place on the parchment covered pan. If you’re in the mood to be decadent, drizzle some olive oil over each egg to add to the crispiness. Not going to win you nutrition choice of the year award, but still better than deep frying. Place the pan in the oven for approximately one hour. 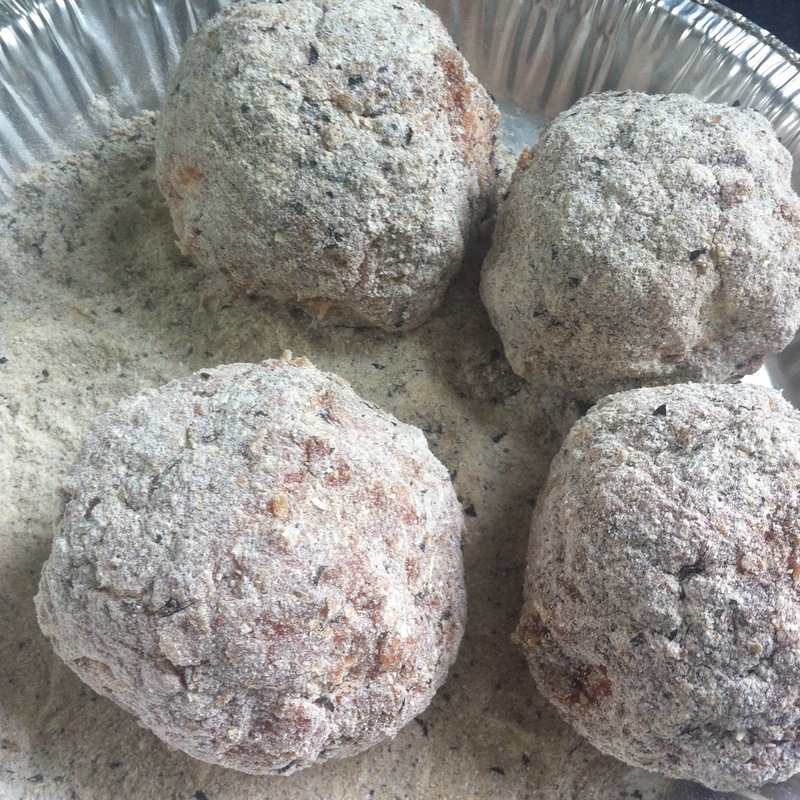 Oven variations, amount of fat in the sausage meat used and type of flour coating will all affect cooking time. At the 30 minute mark you may want to turn them with tongs to maintain some roundness. Don’t be alarmed if you notice some of the fat leaking out and maybe even a bit of cracking. This is actually an added benefit to baking rather than frying. The fat will help add crispiness to the eggs but some of the excess will be left behind. If you notice that the eggs are starting to get too brown before the hour is up you can cover with tin foil or turn down the oven. You don’t want them to burn, but want to ensure that the sausage is cooked through. Serve warm with a small salad, or as an appetizer with slices of old cheddar, some pea shoots and some gherkins and cocktail onions or simply have it cold for lunch the next day. This entry was posted in Appetizer, Cooking, Food, Friends, Holidays, Recipe, Side Dish and tagged eggs, Haggis, Robbie Burns, sausage, Scottish by mostlynoodles. Bookmark the permalink. Making Scotch eggs has been on my list of ages. Going to try your recipe this weekend (or next)! Here’s a wee dram to you, tonight! I had a wee dram of Bowmore Islay and toasted all of your family. And try the eggs – they are messy but so easy! I’m with you on the upwelling of happiness at the sound of the pipes but the sight of a man in a kilt makes you swoon?? I can think of a few from our childhood Burns nights that may challenge that statement. Oh, the hairy, knobby knees of ‘old’ men in kilts. Tonight I’ll raise a single malt in memory of the original men in kilts (you know who they are).